In the world of Lottery Ticket ― a low-rent Friday sequel knock-off ― the projects are a colourful and vibrant place where rambunctious older women (Loretta Devine), stylish gang leaders (Keith David), retired, old boxers (Ice Cube) and idealistic youths live together in stereotypical harmony, observant of uncomfortable, violent realities, but trite in their ideas of community. Guns are drawn, but never fired and no one deals drugs. They merely slight brainy types by calling them "Urkel" and repeatedly ask each other, "You know what I'm talkin' about?" 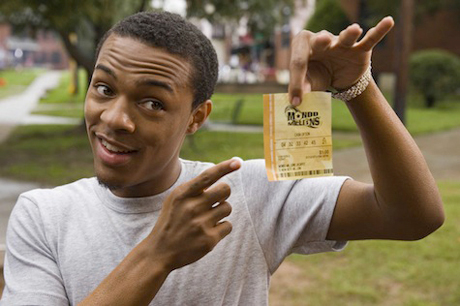 Kevin Carson (Bow Wow) wins the lottery, falling into $370 million dollars after ironically pointing out that the lottery is merely a tax for the stupid. Unfortunately, he can't get his winnings until after July fourth, prompting him to borrow $100,000 from a loan shark and go on a shopping spree, spending all of the money in a single night. Essentially, this is a yet another story of money corrupting, or at least creating problems, as Kevin almost immediately turns on his best friend Benny (Brandon T. Jackson) when he steps into riches, rubbing with the very shady types he spent the first half of the movie avoiding. It's not particularly logical, but neither is the film, which plays out mostly as an awkward parade of bumbling plot devices and terrible jokes. There's a message in there about acting responsibly with winnings and giving back to the community, sure; it's just mixed up in tonal strangeness, with broad comedy and street violence meeting clumsily.